Those who are the followers of the latest trend fashion will surely admire both Motorola Moto E and Samsung Galaxy S Duos 2. Both the smartphones have been manufactured recently. 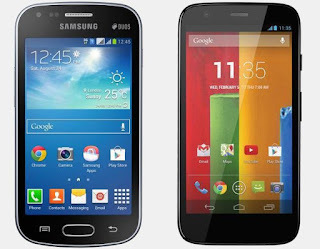 Due to their classic OS, hardware processor, camera and large memory space features, there is a massive obsession for Motorola Moto E vs. Samsung Galaxy S Duos 2 in the market of mobile electronics. Moreover each of this Android phones is available in an array of colours – white and black. There are some similarities and differences between Motorola and Samsung sets. Both of them are remarkable for their vista of features. Dimension and weight – The measurement of the height, width and length is an important factor for any phone user to judge its convenience. Hence the dimension of Moto E is 124.80x64.80x12.30 mm while S Duos 2 has the dimension of 121.50x63.10x10.50 mm. Again Motorola model weighs 142 g and Galaxy set has a weight of 118 g. Thus Moto E is ahead in dimension and weight than Galaxy S Duos 2. Hardware Processor – Interestingly both Motorola and Samsung is well known for its supreme quality of 1.2 GHz dual-core hardware processor. But Motorola Moto E consists a processor incorporating Qualcomm Snapdragon 200 which is absolutely absent in this Samsung Galaxy set. Operating System – This particular factor makes a mobile phone further technologically advanced. Moto E is designed with Android 4.4 and the OS for Samsung Galaxy is 4.2. Memory Storage Space – Each of these Android phones has 4 GB internal storage. But they are different in case of expandable storage. For Samsung Galaxy S Duos 2 it is up to 64GB while for Motorola Moto E there is an expandable storage system till 32 GB. Quality Camera – Both the Android phones have a rear camera of 5 MP with the facility of flash. While Samsung Galaxy S Duos 2 has a front camera of 0.3 MP, it is absent in Moto E.
While comparing between them Motorola Moto E is leading in the dimension, battery capacity, RAM etc, Samsung Galaxy S Duos 2 is found to be advanced in expandable memory, front camera etc. Thus looking at their comparison you will be able to put your recommendation for Motorola Moto E vs. Samsung Galaxy S Duos 2.